Do Some Damage: Luther - Just Another Cop Show? I've copped to a few weaknesses and prejudices before. Chief amongst them would British crime drama's centred around brooding maverick cops. Does the world really need another? 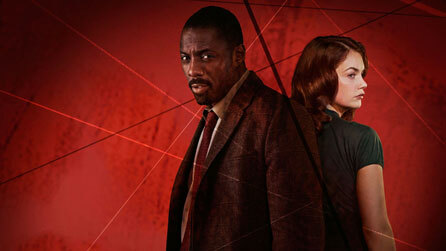 So when the BBC's Luther aired over here I have it a miss. I heard rave reviews, but they were often from people whose opinion's I didn't trust. So the show sailed by and we never sat down in each others company. But the word of mouth continued to build. It soon turned out that even people who shared many of my views on British TV found time to throw a little praise at the show. And after hearing Paul from fuzzy typewriter gushing about it on our last podcast recording, I decided to put my own issues to one side and give it a go. Much of the ground the show treads on during it's first episode is familiar territory. There's a troubled cop, who's genius is only matched by his capacity for destruction. There's the boss who keeps offering him fresh chances, the harassed looking best best friend who keeps pulling him back from the edge. So far, so by-the-numbers. The writing and directing raises it up a few notches. It's well crafted and it pulls you in. But for a while it couldn't pull me all the way in. I couldn't get past the fact that we've seen a lot of this done before, even though the show was doing it very well. By halfway through the six-episode run I was getting a bit jaded with the serial-killer-of-the-week format. The show never fully committed to it, and I couldn't figure out why. What I mean is with each episode we would get introduced to a fresh psychopath, and a quality actor capable of running a million miles with that character, but each week the ending would be a rush-job, a sprint to the finish in the last ten minutes in order to get to the next episode. At first I didn't notice the things that were coming together in the background; the interesting relationship between Luther and the murderous Alice. The moral double standards that were constantly being exposed, and the very, very quiet acting of Steven Mackintosh. Then in the last two episodes it all comes together, and boy is it worth it. But I'll get to that in a minute. First I want to talk about three of the actors. Idris Elba will be known to most of the people reading this. He will forever be the man who stole my name and dreamed a little too big in Baltimore. Of the two, i still say Stringer Bell is his best work, but I really enjoyed what he did with John Luther. As I said before, the role itself is a well worn trope. It could almost be a thankless task, a mere vanity project for an actor who wants to wear a leather jacket and seem edgy without having to do anything new. But Elba manages to dig into the cliche and bring us out an interesting character. He reminds us that these types of characters used to hold our imaginations for a reason; they're brilliant, brash and damned compelling. Often these shows never leave us in any doubt that we should be rooting for the main man, we should always be backing his plays. But here even the audience is challenged by some of the decisions he makes. Part of his back story is that he may have allowed a man to fall to his not-quite-death. We see enough of what happened to make up our own minds about whether or not he crossed the line, but the show refuses to give a definitive answer one way or another (Arguably this changes in the final episode, depending on your reading of it.) A fault I found with the Ian Rankin novel A Question Of Blood was that it set up something similar but then went to lengths to exonerate Rebus before the story was finished. Leave us guessing, please. Let us do the work. I mentioned the quiet acting of Steven Mackintosh. It's easy to miss the work that he's putting in. Essentially for much of the season he's playing an anchoring role, allowing Elba to go off on his wild lunges. But what he's also doing here is giving Luther a solid base, a gravitational pull, and when that relationship changes later in the series the audience feels the ground move beneath their feet. Finally, Ruth Wilson gets to have a lot of fun as Alice Morgan. We first see her as a cold blooded murderer, one clever enough to get away with it. But as the weeks roll on, we grow to like as does John Luther, and her character is key to the shifting morality of the show. We are challenged even as we watch. We like her, but she's a killer. At some points we route for her, what does this say about us? Okay, back to the last two episodes. I know the show has been airing in the US recently, and I don't know where you guys are up to. So if you want to check out here and come back in a few weeks, now is your chance. If I was getting bored of the serial-killer-of-the-week format that was troubling the shows early episodes, I can't help but feel it was because I'd walked into the trap. The writer was setting us all up for something different, and was going about it very methodically. Each week a different double standard was exposed. Each week the killer bounced of a different part of Luther's troubled psyche -and a different part of our own- to lay groundwork. The penultimate episode tells us things are changing straight away. We're presented with a kidnapping case, very different to the format we'd seen in the previous episodes. And yet, for all the heavy lifting that goes into setting up that plot, It's one big swerve. It's the first 90 minutes of Fight Club, before Ed Norton tells us to fasten our seat belts. And by the time the big ending hits, the whole show has turned on its head. Just another cop show? Hardly. The final episode is a fun thriller, It plays with time, and suspence and it uses it's characters brilliantly. Every decision means something, every mistake has us wincing at its outcome. And the morality gets more and more interesting. Bringing the whole point of the series to a head, we see the teaming up of a human rights lawyer, a sociopathic killer and a troubled cop. Each of them has had to give up something of themselves in order to make that decision, each of them has had to step onto the other side of the line that had been drawn way back in the first episode. Can they come back from those decisions? I can't wait to find out. So, was I right about Luthor? Was it just another cop show? I don't think so. I just think it wanted us to think that. I dared us to think that, so that it could hit us over the head when it changed course. Really interesting TV. I had the same reaction to the initial episodes and I think your critique is spot on. The superb acting is really what kept me going through the cliches (and, for my taste, the overly dark psychopaths). But in the end, I realized this was so much more than a standard cop drama. As a big fan of Spooks/MI5 and writer Neil Cross, I knew more was happening. What a thrill when it all came together -- even as it left room for more.